I am at that age now where people all around me are having babies, lots of them all over the place popping up everywhere, like some kind of epidemic! Last month was particularly special though as I become both and Auntie and a Godmother. As my Brother and best friend both had beautiful babies. So I figured it was time to stop making grown up clothes and start on some baby gear. Well the first thing I noticed was how much less fabric you need, also how quick baby clothes are to sew. Fabulous! As a bit of a lazy sewer anything quick and easy really grabs my attention. 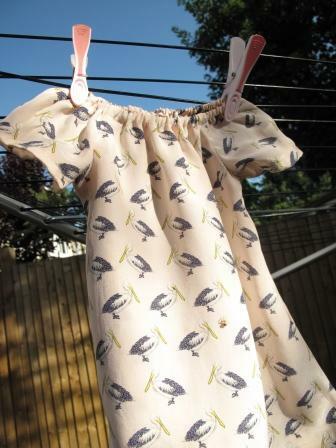 I made this dress for my God daughter using a bit of left over silk with pelican print all over it and a free pattern from Sew Much Ado find the pattern here. I also decided to have my first try of French seams (I know I can’t believe I have never done one before). Well I don’t know what I was so worried about, they were a easy to do and gave a lovely finish inside. Think I will be adding French seams to everything I make from now on. Tilly does a great tutorial on French seams here. Now to make something for my Nephew…. I’m not sure he will be up for a pink silk pelican dress?? Competition time!! The Anna caption comp!! SO pretty.. Isn't it fun to sew for little ones.. I love it. I made some lovely dungarees for my 18 month old grandson from leftover Linen and cotton mix. You will find you make very original baby clothes from an assortment of left overs. Waste bits of fabric becomes a thing of the past.